Last Sunday I took the day off and, together with my soroban class mates and our teacher, of course, we went to Himeji, about 1.5 hours south of Kyoto. 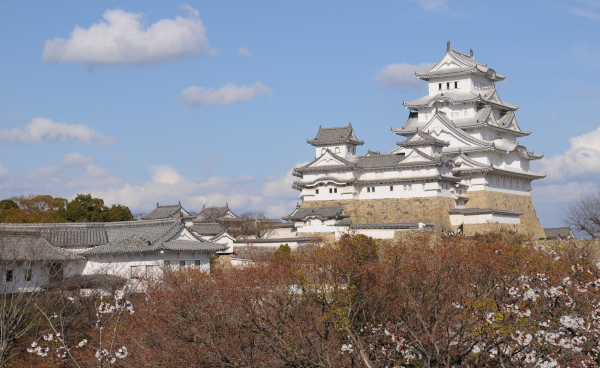 There lies Himeji castle which was built in the 14th century, and it is lauded as the most beautiful castle in all Japan. Its wooden construction is still intact, and the white exterior and the great position on top of a hill – and directly visible from the station – makes it one of the most popular places to visit in Japan. It was rather busy, not only because of the weekend, but because people went there for their hanami. Himeji is very famous for the cherry trees on its grounds, but it was still quite cool, so not many of the trees were in bloom. There were still enough people that it took us more than an hour from the ticket gate to the inner keep, and inside the castle, we had to wait for one floor to empty before being allowed to climb to the next one. We spent several hours in the castle and had great fun even though the weather was cool with lots of wind. 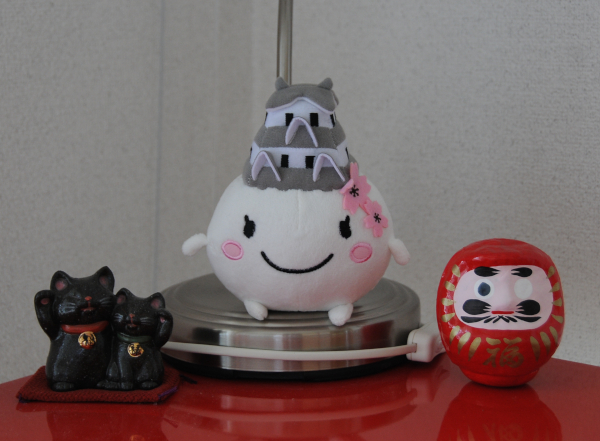 My personal highlight was meeting Shiromaruhime, the mascot of Himeji. The word means literally “White Circle Princess” and many people were lining up to take pictures with her, and so did our group. I usually don’t buy souvenirs, maybe a postcard or two, but I caught a severe case of cute overload and could not resist buying a small plush toy that is now adorning my desk. She’s really cute, don’t you think? This entry was posted in day trips by Iris. Bookmark the permalink.